Thanks to the riders, donors and sponsors of the Pennsylvania Perimeter Ride Against Cancer there are many more cancer survivors than there were when the first group went riding around the borders of Pennsylvania in 1983. But there's still much more work to do in the fight. So every other year a new group of riders, along with a number of long-time veterans, raise as much money as they can before starting their week-long ride of hills, heat, tears and even more smiles. Our riders vary in ability from fit recreational cycling enthusiasts to ex-bicycle racers. They represent a wide range of professions, interests and backgrounds and average about 45 years of age. Over the years, riders as young as 15 and as old as 60(ish) have completed the 500+ miles. Riders travel at their own pace in groups of others of the same speed. As a rider you will be given a daily cue sheet - a description of the day's route with landmarks and distances. You must be prepared to pedal your bike 80-100 miles a day, often over many difficult climbs. You'll be expected to make routine mechanical adjustments such as changing flats on your own. Your day on the road usually begins at 7:00 am and ends by 4:00 pm or earlier. • July 28, 2019 - Registration: 6:30-8:00AM. Holy Trinity Lutheran Church, Palmerton, PA. Palmerton Sendoff: 8:30. Bus leaves at 9:30. 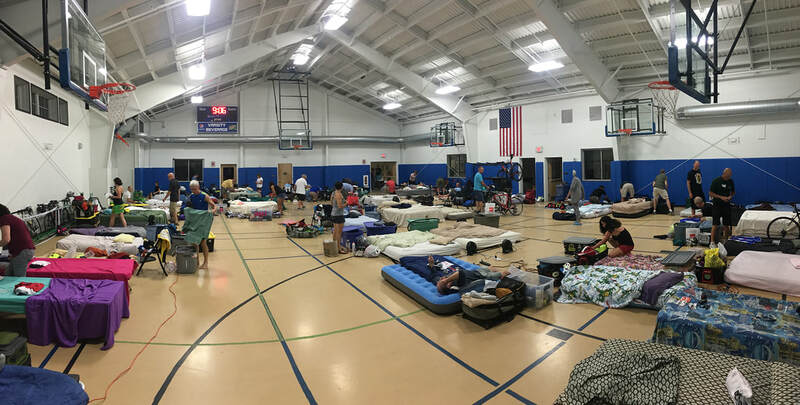 Overnight lodging is provided by churches and schools along the way. Typically, riders sleep in a large rec-room or other available space. Showers are available either onsite or at a nearby gym or other prearranged facility. Swimming is available at some locations. Volunteers in each town provide hearty dinners and breakfasts, which are much appreciated. PPRAC volunteers serve a picnic-style lunch at a designated location along the day's route. There are usually food stores and small restaurants along the way, as well. Assisting the riders, up to five support vehicles travel with the PPRAC. One carries the riders' luggage to the next day's destination. One circulates among riders making random checks, giving assistance when mechanical or physical problems arise. Our mechanic will be out on the route, providing help along the way, as well as at evening stops. If a physical or mechanical breakdown renders you unable to finish the day, the SAG vehicle may pick you up. All vehicles carry emergency provisions. Support vehicles are manned by PPRAC volunteers, usually family or friends of riders. If you or a friend are interested in serving as an on-the-road volunteer, a driver to our starting town for the week, or can provide a support van, truck or car, please contact Bob Freed at rfreed7@hotmail.com.